I first came across bamia in Damascus. 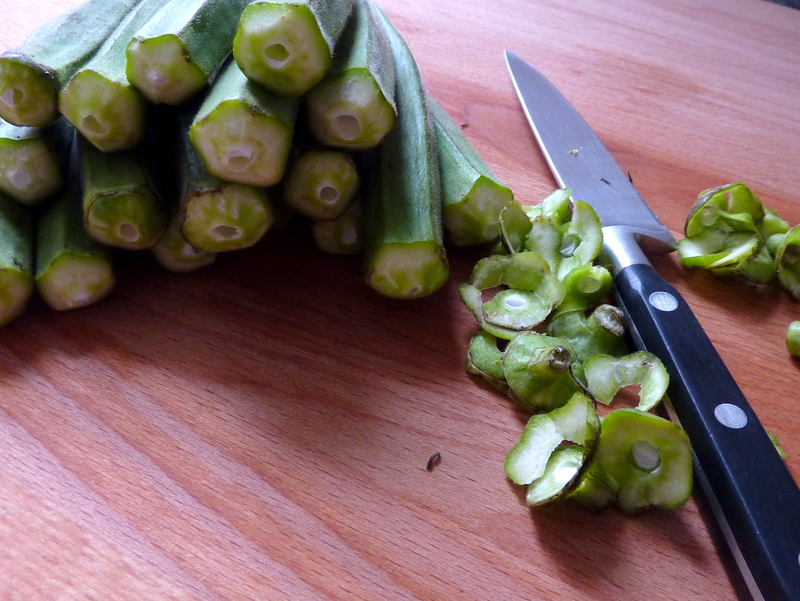 Otherwise known as okra, ladies fingers or gumbo, the bamia is a green, hairy vegetable, a few inches long and tapered at one end. Thought to be a native of Africa, this strange-looking vegetable is actually the seedpod of a lovely flowering plant belonging to the mallow family. 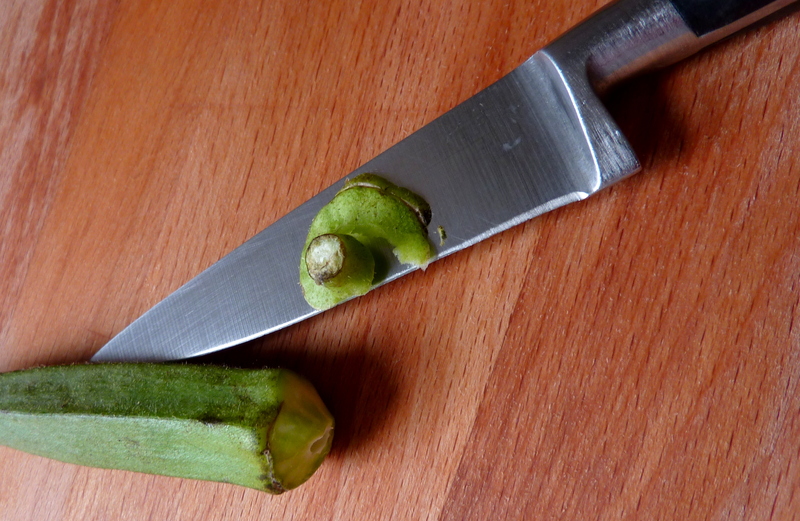 If that’s whetted your appetite to find out more go here http://en.wikipedia.org/wiki/Okra If not, read on. When I first met them in my mother-in-law’s kitchen, they were small, shrivelled, and a bit dusty. These were dry bamia – fresh bamia that had been threaded on string and put out in the sun to dry then stored for use in the winter. A handy staple, they can keep up to a year. They didn’t look very appetising but I was at the experimental stage and eager to try almost anything I hadn’t come across before. Fatmeh, the family servant, cooked them in a rich tomato sauce with chunks of tender lamb. The bamia were transformed. Instead of being hard and dry, they were soft but still with some bite. The tomato sauce was sweet and slightly tart but not with the tang of lemon juice as I had thought. Instead, Fatmeh showed me a bottle of thick, deep red syrup that has become one of my favourite cooking ingredients – dibis rahman. A sticky sweet/sour syrup made from pomegranate juice, this magic ingredient is used in Middle Eastern cooking to add depth and flavour to many dishes, especially tomato-based sauces. You can buy it in the UK as pomegranate molasses. The next time I met bamia, they were lying in a basket in the sun in the municipal market in Paphos. They were fresh and bright green with little silver hairs. I bought some. The old lady who sold them to me recognised me as a foreigner who probably had never cooked them before. Whipping out a small knife from the voluminous folds of her shapeless black dress, she decided to give me a lesson in how to prepare them. Making a small incision she worked her way around the stem until she had detached the tough outer layer in an unbroken spiral. I watched and learned as she kept up a stream of instructions in Greek, and deftly removed the hard conical tops. Buying bamia – small, unblemished ones are the best but not always easy to find. You can use larger ones as long as they are firm. Some of the most successful bamia dishes I have produced have been made with frozen bamia. 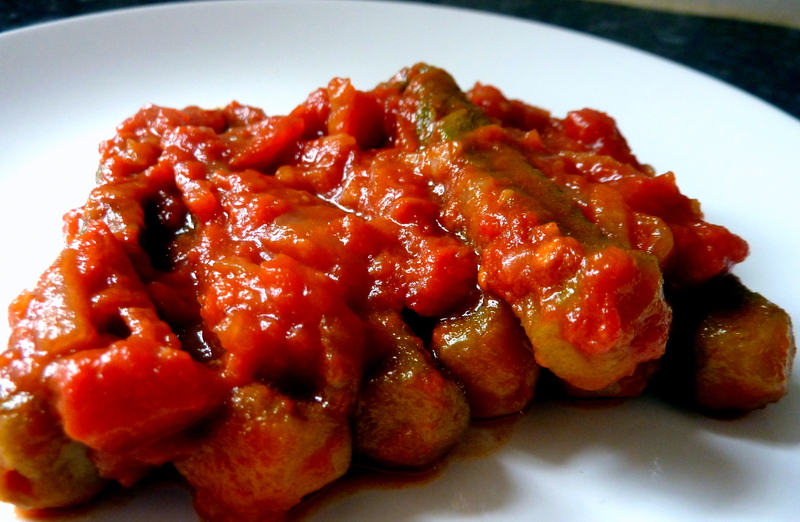 There are many recipes using this strange-looking vegetable but my favourite is stewed in a simple tomato and onion sauce. Wash the bamia, if using fresh. With a small sharp knife, gently cut round the small stalk at the top of each bamia, taking care not to cut into the bamia itself. Heat the oil in a large pan and fry the onion until soft. Add the garlic and sauté for a few minutes taking care not to let it burn. Add the bamia and sauté for 5 minutes, stirring. Add the tomatoes to the pan and season with salt and freshly ground black pepper. Cover and simmer for 20 minutes until the bamia are cooked but still hold their shape. Add the pomegranate molasses and cook for another five minutes. The sauce should be thick with no water. If not, boil it without a lid to reduce it more. If the bamia have split remove them from the sauce before reducing. Serve with rice or fresh pitta bread.